Okay, let’s take that second look at Daredevil #32, shall we? Specifically, at the “sensory aspects” I mentioned in my review. You see, I found the scene of Matt entering the Jester’s house and finding the fake Foggy to be so well done from a senses perspective that I wanted to revisit the scene and tell you what I found so impressive about it. Now, what is interesting about this scene is that not only that Matt doesn’t quite recognize what it is he’s “looking” at, he doesn’t even fully register that he’s looking at anything at all, or at least not anything interesting or attention-grabbing. Not at first. 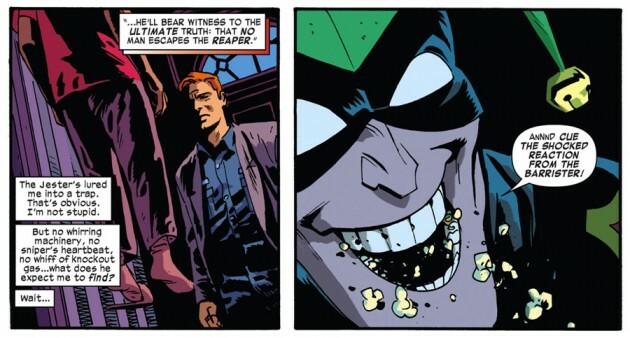 I can see some readers potentially reacting to this, wondering what Daredevil’s senses are good for if he can’t “see” something that’s right in front of him. 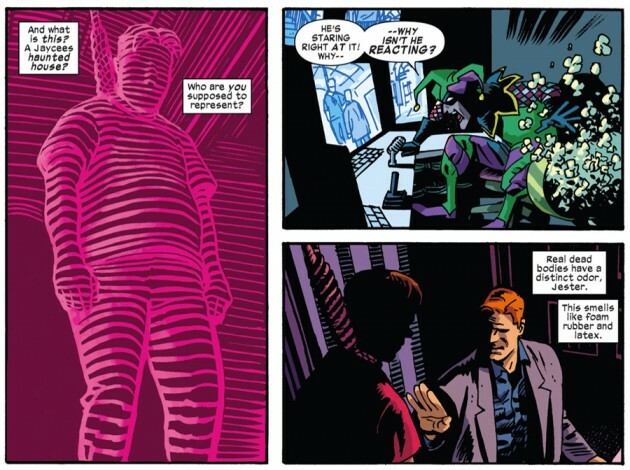 I will get back to why and how this makes sense (at least to me) in my treatment of the following panels, but for now I will say this: The “delayed reaction” interpretation of the radar sense has actually been quite common throughout Daredevil history. 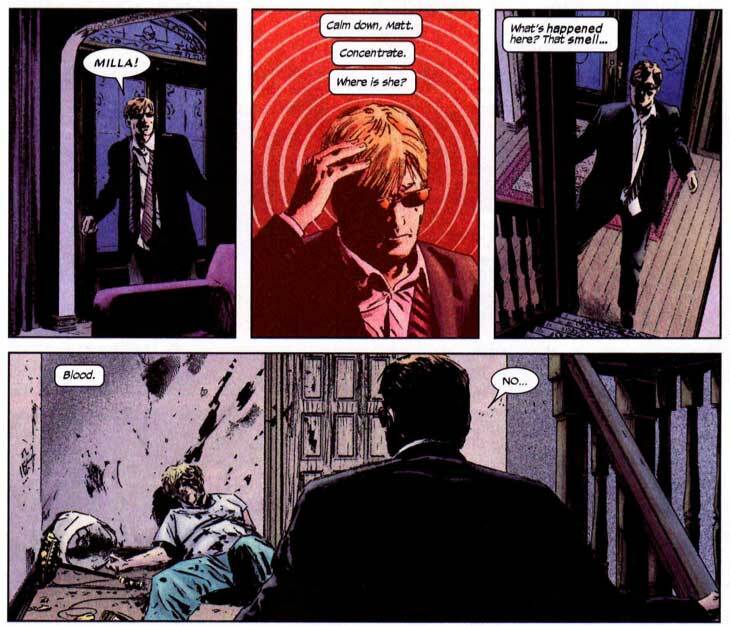 The list of scenes in which Matt assesses a situation by sort of peeling back the layers, and finally commenting to himself that “now, my radar sense is picking it up!” is definitely a long one, and it spans every decade of Daredevil publication. One of the more recent cases of this phenomenon that come to mind is a scene that is somewhat similar to this one, from Ed Brubaker and Michael Lark’s run. In Daredevil #104 (vol. 2), Matt comes home to find that his wife Milla (driven insane by Mister Fear) has left her nurse beaten on the stairs in front of him.. When Matt enters, he at first doesn’t notice the unconscious woman. It is only after he smells the blood and focuses his attention in that direction that all the pieces of the puzzle fall into place. This example is relatively recent, but as mentioned, it has been common for Matt to pay more (and more immediate) attention to information gained from his other senses. This is evident in these panels from Daredevil #32 as well. Matt is clearly listening and smelling for threats before doing anything else. Only after Matt has dismissed any immediate threats coming through his heightened senses of hearing and smell, does he appear to pay much attention to the dangling body shape in front of him. This may seem odd, but it need not be. The fact is that all of us generally “sense” more than we “perceive” and are able to consciously pay attention to even less. More and more research supports the idea that our own sense of feeling as if we see, hear and take in almost everything around us is largely an illusion. Just google “inattentional blindness” and “change blindness,” or better yet, look them up on YouTube, and you’ll be amazed at how much all of us actually miss without even knowing it. When you look at Matt Murdock’s senses (and lack thereof), there is the further complication that many of the things that usually grab our visual attention, such as colors, details, the distinctive features of things we recognize, are not available to him. More than likely, his idea of Foggy probably includes an expectation of a certain “Foggyesque” shape, but far more distinctive are things like scent, his voice and other bodily sounds (heartbeat, breath sounds, the intestines moving around), footsteps, a general movement pattern. All of those characteristics that scream Foggy to him, as opposed to someone who may just be of the same general body type, have been removed from this lifeless dummy who, to Matt, could be anybody. Of course, even just any body hanging from the ceiling, might be expected to grab someone’s attention, but again, that’s if we assume the same hierarchical ordering of the senses that exist in people with the usual five. The radar sense (regardless of what it is, for these purposes just thinking of it as an ability will suffice), is absolutely necessary in order to explain how Daredevil can do the things he does as a superhero, no doubt about it. However, in the larger scheme of things, the radar sense, when seen as a vision analogue, isn’t really a very good source of high-resolution information for him the way his other senses are. The radar sense lets him navigate safely through the world, and makes it possible for him to recognize objects with distinctive enough shapes, but I find it highly doubtful that Matt expects to “visually” be able to make sense of everything he encounters, especially right away. A stationary scene like the one in Daredevil #32 likely requires some active sampling of it before the pieces that make it up can be properly categorized and understood. He also reaches out to touch the dummy, which is obviously another way to gather more information about objects in the absence of 20/20 color vision. In this kind of context, a body (or other object) hanging from the ceiling might seem to gradually reveal itself. Matt recognizes what it is, to an extent, but not in the immediate way that the Jester expected. Great write up. As a somewhat new Daredevil reader I often catch myself thinking that Matt has better ‘vision’ than everyone else because of his radar but it’s situations like this one that show how different his view of the world is and how vulnerablenhe can still potentially be. How can Mark Waid be so brilliant on Daredevil and fail so miserable on Indestructible Hulk. It’s unreal how both books read when you compare the two. I love Waid’s Daredevil but I can’t wait until he leaves the Hulk Title. I’ve been so impressed with Waid’s Daredevil that I have been reading older Issues of Daredevil. It just took a writer like Waid to make me understand the character of Matt Murdock and his alias. Has anyone else read his Hulk run. If so do you feel the same way. All the love that I see that he puts into Daredevil is missing. I hate to use the word but I think comic reader refer to it as phoning it in. Regardless another great article. I gotta disagree. I got into comics about 18 months ago and Indestructible is a title I have enjoyed since issue 1. I like the angle he has taken giving a bit more attention to Bruce Banner. It has made me go back and read classic Hulk arcs and now Hulk and Daredevil are my two firm favourites. I’ve read Planet Hulk, World War Hulk, Hulk:The Endnand Jason Aaron’s run. Do you have any further recommendations? For me I think Waid has really started hitting his stride now on Indesructible Hulk, with the current Agent of T.I.M.E arc. Before that, I didn’t even particularly enjoy the Blind Rage two-parter. But did anyone read that Hank Pym one-shot he wrote? That was more like the Waid were used to on Daredevil for sure. Which one was that??? I like how Pym has been a sometimes supporting character in Daredevil. If they ever make a Pym book I wouldn’t be surprised if Waid had the job. The issue was Age of Ultron #10 A.I. It was like an epilogue to the Age of Ultron event (which I didn’t read), but was still a great examination of Hank and what sets him apart from the other big brains of the Marvel Universe. Thank you! I didn’t read Age of Ultron but as long as this is a one shot I’m going to get it. Bill Mantalo Hulk crossroads run is really great. #300 and up. The Mr. Fixit (Grey Hulk) run is great also. Waid Stated that he doesn’t really know how to write the Hulk. He said he has a voice for Bruce Banner but he can’t wrap his head around the Hulk. The muted Hulk is not his doing but a mandate by marvel. Marvel trying to make their Hulk title closer to The Avenger film. I think writers do the title more justice when the have a chance to try to develop the Hulk as a character. It is so strange that they have gone this route with The Hulk. The reason the book has so much trouble in the early 2000 was that they really didn’t know how The Hulk should be. It wasn’t until Greg Pak wrote Planet Hulk that we had a clear voice for the Hulk. I for one think with waid’s approach that he took for Daredevil should have been what he tried to achieve with The Hulk. Going back to the child like Hulk ( the hulk smash hulk just wants to be left alone version) would have been retro to the Hulk like it was to Daredevil. I think I like the focus on Banner. I like the Hulk but I’m not a fan of all the fighting and smashing, rather the internal struggle of Banner. I’ll see if I can get some of the Bill Mantalo issues. Thanks for the tip. I love reading about Banner also. 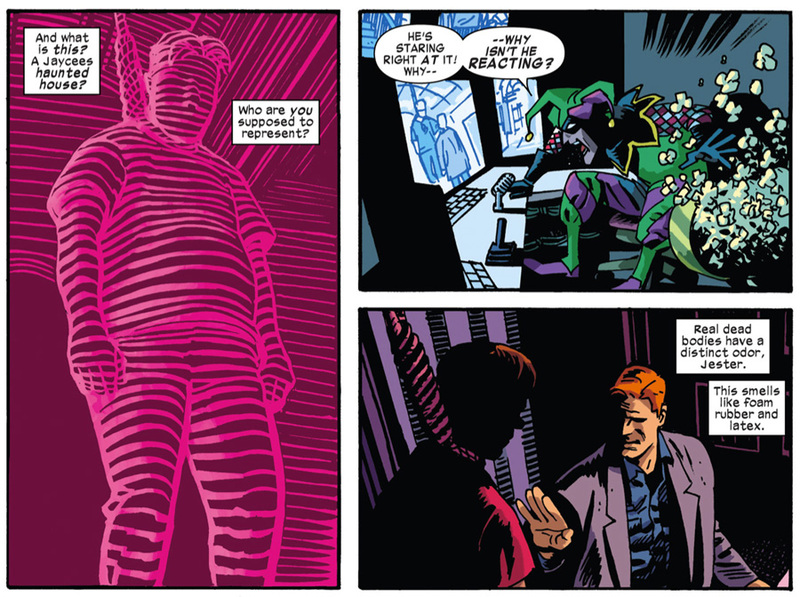 Waid gives us a perfect balance of Matt Murdock personal life and his life as Daredevil. Waid has given focus to Bruce Banner but his version of the Hulk is what a lot of fans are having trouble with. You will enjoy Mantalo issues but be warned Bruce Banner is nowhere to be seen. You are welcome. As with any book there are so many great issues. Just keep looking and you will always find a great story. Take Care. To help you find those classic Hulk stories, the name othe author is Bill Mantlo , not Mantalo. He scripted 60 or so issues for the Incredible Hulk starting around Issue 250, and ending on 312( Most of it has been covered on three paperbacks), on recent years.